There’s little more classic in 1960s coat styles than the pea coat, and there’s been a slew of handsome and affordable versions on the high street this Winter. If you’re on a budget, Topman‘s selections include a variety of cuts, colours and materials, one of the best being this Navy version by collaborating designers Self. 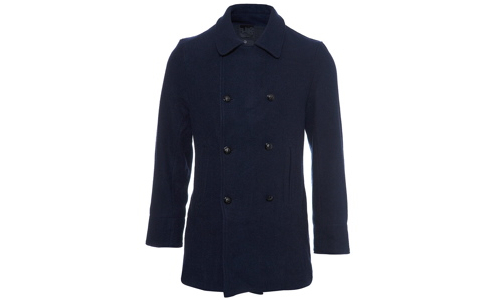 Made from a wool blend, the military buttons and sleek cut make this a great piece of luxurious style from the high street. The high collar and three sets of double breasted buttons finish off a great 60s look jacket that’s timeless. Get it from Topman now for £110.